Made from sterling silver and blue composite stone, this pendant appeases the peacock in all of us. Since his childhood flitting around with a flock of exotic parrots and canaries, Cesar Palma has always tried to capture the essence of birds. 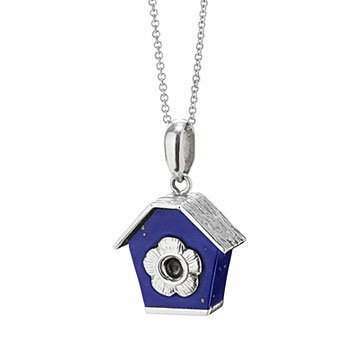 Using sterling silver and blue composite stone, he crafts this elegant birdhouse pendant to do just that—with a pop of color and a slight glimmer to appease the peacock in all of us. Handmade in Massachusetts. Cesar Palma graduated from Pratt Institute with a BFA in art direction, but was always more drawn to downtown theatre, performance art and costume design than Madison Avenue. After several years as a private label designer for both jewelry and tabletop for a major department store, Palma went out on his own with a giftware and jewelry line. Palma has never looked back. Cesar Palma is a bird of many feathers. Mainly self taught, his design work ranges from furniture, tabletop, giftware and jewelry. He strives to find the right use of color, shape and materials to convey the essence of his inspiration. Because of its scale, jewelry has always been his first passion. Wet product first and clean with sponge dipped in polishing silver cream.